The Winning Start : A crucial element in building a strong and productive sales force id making sure that every team member is well-trained and capable of helping the clients. You need a sales force that works as a single machine, focused on breaking through all challenges to win customers and deals. This is where we come in. We help build your dream team of new and existing sales executives through a comprehensive sales boot camp that gives them the essential knowledge, tool and skills to become successful I their roles. The RightStart™ sales boot camp is the essence of sales Optimization that equips your sales professionals with the core skills and knowledge needed to be more successful. After attending the boot camp your sales executives will gain more confidence in what they do, generating more revenue for themselves and the company and making them happier about their jobs, which translates into less employee turnover, and more importantly having happier clients that will continue to do business with your organization. 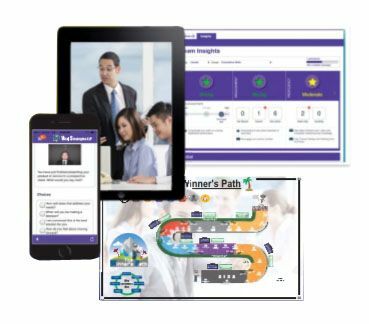 A continuing journey : beyond the RightStart™ program our comprehensive enablement roadmap that combines virtual, classroom, mobile, science and analytics to create a scalable and simple approach to keeping your sales teams aligned and ready to win.